The Bassbone OD is a bass preamp with two instrument input channels, each of which is fully equipped with a level control, super powerful passive-interactive EQ and a low frequency filter to help eliminate resonance. Channel-A is equipped with a PZB booster switch that increases the sensitivity and load to 10 meg ohms to optimize it for use with piezo transducers as commonly used on upright bass. Channel-B takes a different slant with Drag Control load correction to optimize the tone and feel when using a passive instrument such as a vintage Fender bass. Toggling between channels is done using a footswitch and both channels may be mixed together by depressing the blend switch, should a dual pickup system be in use. Outputs include a ' instrument level output to feed the artist's on-stage amplifier plus a balanced low-Z Radial DI box output to feed the PA system. The XLR output can be assigned pre or post effects to suit the engineer's preference. A separately buffered tuner output works with the mute footswitch for quiet on-stage tuning. 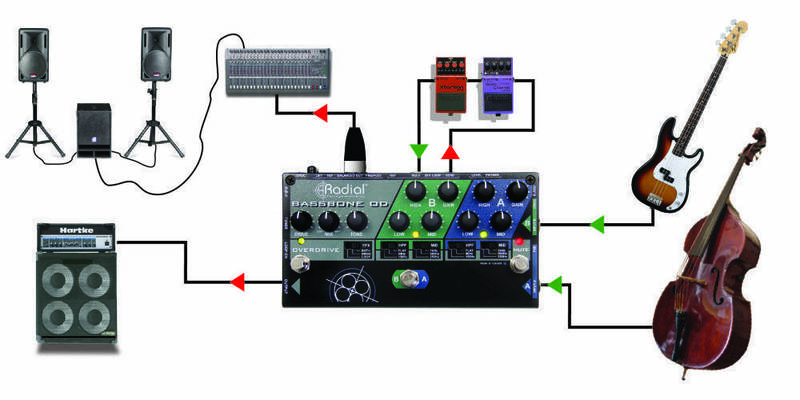 For bassists that employ effects, both input channels can share the same pedals by connecting via the built-in send & receive effects loop. This is augmented with an on-board bass overdrive with control over the drive level and tone. A wet-dry mix lets you add slight grit similar to an Ampeg SVT or full on distortion depending on your mood. The OD footswitch may be assigned to the loop, overdrive or both. Finally, a built-in headphone amp with 3.5mm output lets you use the Bassbone on the bus for those long drives between gigs. I needed this for several reasons. I wanted : a decent DI; great overdrive with mixable dry sound; two eq channels; and mute. I set my amp flat and let this do all the work. Switchable mid frequency switch on each channel gives tons of tone variation. Each channel can have a totally different eq and gain setting, so great for solos etc. The pedal can be configured so that both channels are driven at once. You can also plug to instruments in, having preset the gain and eq for each instrument, which means swapping basses on stage is quick with no hassle about how it might sound. The overdrive is great! Mix in some dry sound to retain the bottom end. Note: the pedal can't be bypassed. You have to be going through channel A or B from the start. Not a problem because it sounds so great. Clean and quiet. Highly recommended. 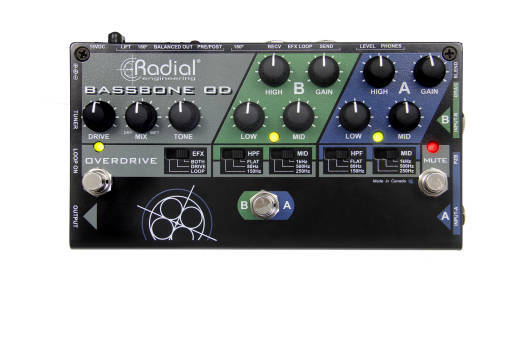 Description: President of Radial Engineering, Peter Janis, talks about the new Bassbone OD bass pedal.